The optimist sees infinity in patterns while the pessimist only sees repetition. Even the chaos and rugged terrain presides as seemingly spherical when one projects him or herself far enough away. The closer you inspect the redundancy in patterns, the more chaotic and multifaceted your subject will become through perception. Symbols, due to their transient nature, can never be as pure as the thing that they represent, and especially run the risk of being misunderstood, thus unjustified, considering we all interpret symbology through our individual stories and experience. The following is an account of my experience as told by me after ingesting half of a jar of Sacramental Peyote Tea in May of 2013 in the middle of the Arizona wilderness. So often do we hear the woe of the psychonaut, and of his or her inability to articulate to those left on Earth, their journeys of the inner and outer dimensions accessible through the ingestion of entheogens. When walking the path of a sacred forest, it is required by law of spirit that we do not take with us a stick or stone or any other artifact, for this would be a form of transferring direct experience into ownership. In this same way does it behoove us to approach the psychedelic trip, not with the intention of taking a piece, but instead, by considering the encounter as an experience to only be taken in the now, and when finished, to be left unobstructed for those who will follow. When dealing with direct contact with source, one should avoid the ambiguity of using or taking symbols. Symbols, due to their transient nature, can never be as pure as the thing that they represent, and especially run the risk of being misunderstood, thus unjustified, considering we all interpret symbology through our individual stories and experience. Last night before sunset I was dropped off with my supplies to a covered fire pit area in the middle of the Aravaipa Wilderness on the grounds of The Peyote Way Church of God with a jar of medicine in hand. I contemplated the area and paced the perimeter methodically, arranging herbs and fruits for burning and offering throughout the evening. Before committing to the ceremony I considered if then was the right time to seek such a potentially profound perspective. I’ve allowed my thoughts to collect into a maze of sorts as of recent, and the idea of examining these catacombs while under the influence of still such an unfamiliar teacher procured in me a type of alien anxiety. 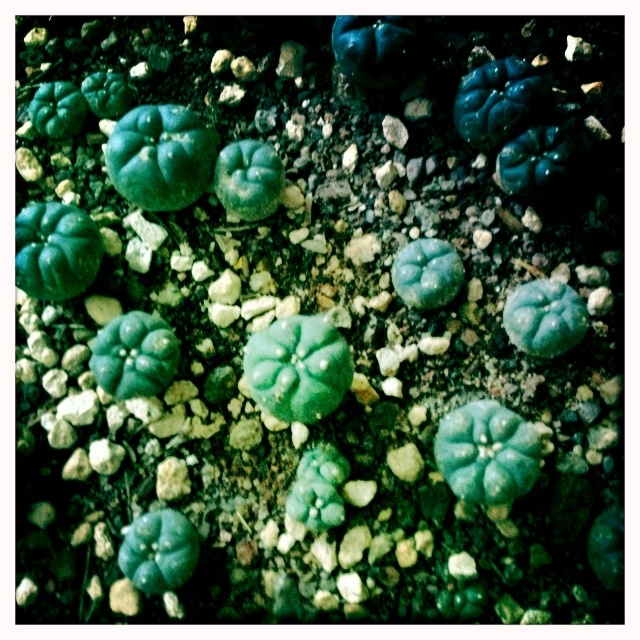 I decided that it was no coincidence that Peyote is referred to as medicine, nor was it a mistake that I currently found myself 600 miles from home holding a sacred and endangered drink in the middle of the Sonoran Desert. Not forty-five minutes after lighting a fire and drinking half the jar of bitter tea did the fabric of static reality tempt to tear, providing only glimpses of insight through the reluctantly opening seams. It was as if the ground were a liquid blanket cloaking gears moving every so slightly just beneath its surface. In comparison to other entheogens, and aside from the nausea, the mescaline was a very gentle guide at the onset. So gentle, in fact, that by two hours into the Spirit Walk did I consider packing up my camp site and hiking back towards the main house convinced that I had already hit my anticlimactic peak, or lack thereof, experience. I was expecting the world to melt and it wasn’t until I tried to stand up that I was instantly thrust back to the Earth onto my back as if in a fit of passion. Staring at the sky I noticed it was now changed. It possessed a deep ethereal blue quality and that’s when the smooth wisps of lavenders and pastel colored energy began to streak the sky. In every which way did these trails mark a new direction until they began to arrange themselves mathematically. In a continual ebb and flow of motion of euphoric eminence did a blue toroidal energy field fill the sky in a circular and throbbing sacred geometrical pattern. The area surrounding the dancing mathematical arrangement never lost its clarity, in fact, never have I seen such powerful visions while the rest of the world remained so seemingly intact. The movements were cool and calm, still possessing hues of blue and I felt a very definite Goddess energy. At this thought, the sacred torus reconfigured itself into a large lavender shadow guide the size of the sky. She danced and manipulated the energy as the sun hid itself behind the nearby range and the stars began to show themselves. I realized then that I’ve always made the mistake of seeing spirit as interpreted though our human filter and how man has always interpreted gods and entities; in our own size and image. For the first time I witnessed an entity that encompassed everything everywhere, including my soul, as I felt a motherlike protection from her dance. By some miracle, she managed to settle the nausea by opening my heart. Human beings do not see the world as it truly is, because we are filtered by our primordial instincts of constantly being in a state of fight or flight. We still partially possess a reptilian brain and many of our behaviors suggest a direct connection to leftover animal stuff which we retain in our genetic conditioning. Mescaline must do something in suppressing these basic functions of instinct, for if I was hunting or being hunted last night, I would have surely starved or have been eaten. Time falls away as does spatial relations. The grass ten yards across the field sounded like whispers behind my ear. I mistook the crackling of the fire before me for footsteps behind me and while I was light years from the stars, it seemed nonsensical to astrally project to them because there was no longer any space between myself and them. With the vanishing of the sun and the nausea in full effect, I decided it was time to release. I purged before the fire, three or four times before collapsing in fetal position not far from the flame. I must have fallen asleep or lost consciousness, because when I woke up, for a moment I forgot where I was. I opened my eyes and entered the peak of my trip to a fiery blue sky and stars with streaks of green and golden energy emanating from their being. Even the floating satellites and space debris appeared to have a golden and silver cord pulling them along through the black of space. The branches surrounding me began to stretch up to the sky like long purple fingers, and while everything appeared so intensely animated, still, the surrounding world was more vivid than it had ever been. I looked away and could see the fire with my eyes closed just from listening to and feeling its warmth. What looked like flames and lava began rushing towards me so rapidly until it felt like I assumed the form of a Phoenix and it was then I who was soaring through the fiery and morphing liquid shapes instead of the other way around. I could feel the wind of flight of passage on my minds eye. I opened and closed my eyes several times, and with each shutter, snake like patterns of black and white geometry spread along that limbo of slit of space that exists just before the eyelids meet. I awoke for the final time, and this time, instead of forgetting where I was, I forgot that I was human and that I have the ability to be physically touched by another. Remembering this, though so seemingly simple, came back to me as such a magnificently profound concept. To remember that I was a human was like being reborn. It was like experiencing the joy in making the choice all over again to be here. I realized then that in all of my ventures in life, including all types of relationships and psychedelic use, I have always been searching for the other whom has also been searching for me. I realize now that this voice in the corner has always been my own, and though we incarnated here to love and be loved, touch and be touched, we must also learn and truly accept how alone we are. I know now that this has always been my struggle. The spirit world is perfect and infinite, yet there is a reason why spirit loves having a body despite its emotional cost. It’s through having a body that we can learn loneliness and alone-ness. If we ever wish to love selflessly, then the best thing we can possibly have to offer another is the nurturing of the comfort in our own solitude. We will never know how we look through another persons eyes, and this just might be the ultimate curse and blessing of this reality. If we were to have this ability, or if we were to posses all of the answers behind the reasoning of creation, then there would be no reason to live out a subjective reality, where we gain the opportunity to observe ourselves in other bodies, oblivious that we are God incarnate, and thus going through the corporal motions with an almost childlike naivety. I remember after last night why it is so difficult and dangerous to articulate anything more than symbols once returning to the third dimensional playing field. There is such a disorientation that occurs during the tear between leaving and entering the spirit world which seems could be equated with being torn from the womb, and it is in this moment where the traveler grasps unsuccessfully as the final constructs of linear memory and reality falls to dust. All that remains is a promise to oneself to always remember that what it was that he or she was shown was the answer. Knowing, yet not remembering, as the keys melt from their grasp, the only thing the traveler can do is trust that he or she were shown the doors of liberation, even if for only a moment. It’s in possessing this faith without remembering that makes each psychedelic experience, especially this one, so synonymous to what has been described by the mystics as the religious experience for ages. The sun disappears behind the nearby mountain range leaving just enough light and time to unlatch the swinging metal gate. I take a quick check of my street car, reminiscing only for a moment of my recently traded in 4×4 vehicle that would have made the 20 mile dirt road much more accessible. I arrive too late to set up my tent, nor am I on time enough to be greeted by anyone other than a couple of horses whose names I do not yet know. Annie tells me hours earlier on the phone to let myself into the main house once I arrive. She explains that she and her husband Matthew will be retiring shortly into their private dwellings, residing just east of where I will be spending the night. I enter “The Front Room” and choose a slightly elevated bed, which I note, most resembles a cocoon. As I put the last of my produce away in the kitchen’s pantry and refrigerator, feeling suffocated by the culture shock, I get the sense to emerge from the building and turn to the stars for comfort. Memories of sky watching flood my consciousness and I feel even further away from the place I call home. I hear a cough and remember that Annie’s oldest son is also staying in the main house. I call out his name, “Joseph,” and after a brief hesitation, he opens the door. I read his character instantly, and know that I’ve made a friend even before we speak. Joseph is a cultured and seasoned traveler who makes a fascinating living selling rocks and gems at national and regional trade shows. I can tell almost immediately that he is the black sheep of the troupe. This includes his younger brother Tristan, and eldest sibling, Joy, whom also live and work on the Church grounds making “Mana” pottery by day with Matt and Annie, and administering the sacrament to the “Walkers” by night. Gidein, the first Spirit Walker of the season arrives today. He doesn’t speak much, though, neither do I. We wait until the family leaves the premises for the evening before engaging in conversation. He is now set up in the “Front Room” and I have moved to the conjoining “Porch Room” which I am also spending my days slowly renovating. The timid Gidein raps on my window to get my attention and we meet out in the kitchen area. He is still quiet considering my eagerness to speak, but then I remind myself that he is fasting and preparing for his spiritual journey. I begin to make dinner as he silently excuses himself. He is scheduled to drink his brew at noon the following day. The next day work is over. Coyotes howl and a bird that I cannot identify sings the moon awake in an ethereal desperation. Twilight shifts to night and the creatures simultaneously silence. I miss my home and at the same time I regret ever being born in a city. I feel like such an outsider as I observe the family serenely maneuvering through this seemingly stunted pace of life. Routine is more of a religion than this institution’s administered sacrament. As much as I miss Los Angeles, I am terrified to return. “I hope you have a strong stomach. Keep it down,” were Gidein’s parting words. He didn’t have much to say, in fact, he seems to be purposely avoiding conversation. He isn’t the same when he leaves. He is changed. I have yet to take my first Spirit Walk at this point. Later, two more arrive. I eye their sports car and take note of their accent and instantly can tell they are from Los Angeles. I steal a look at the guest registry and confirm my assumptions. 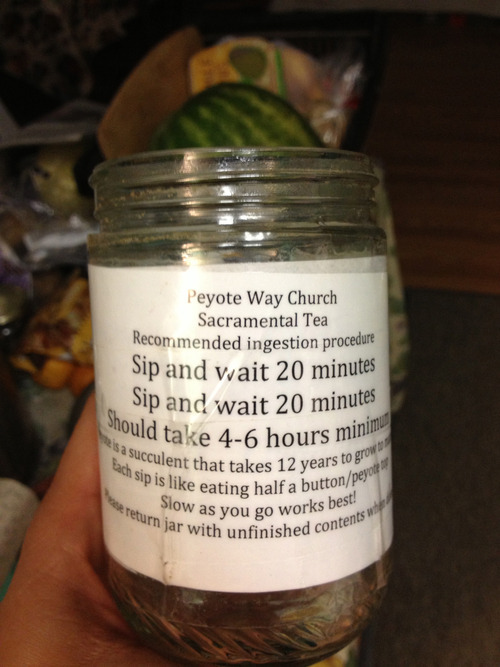 While juicing for myself and the family the next morning, I am a little shocked to see Annie enter the premises with the Peyote brew and then proceed to cook it in the main house while sharing with me some ancient secrets of its preparation. I am told that I will be working in the garden today. I panic slightly, and only because I finally have gotten used to tooling away in the back room away from the family where I can more easily avoid my thoughts. For some reason, being on the east side of the land, away from my dwellings, causes me to feel exposed. About an hour into installing a solar panel, Tristan and Joy invite me into their parent’s house for breakfast. They do so after a brief conversation where I tell them that I am still feeling anxious from the lack of human contact in this Arizona wilderness. They obviously pick up on my inadvertent cry for companionship as we sit and eat and make small talk. At noon, the two Los Angelinos are sent to separate ends of the property for their Spirit Walk. I bid them a good journey, yet meanwhile, my emotions are all over the place as I turn planter beds, load wheel barrows and transplant compost. It isn’t until I take a bike ride later in the afternoon that I run into one of Los Angelino Spirit Walkers as I am leaving the ranch. He acknowledges me, but clearly from another dimension. I try not to make eye contact. I nod and leave him on his journey. He holds a walking stick and is pacing himself methodically amongst the grounds. Similar to my mood, the weather cannot seem to decide between unrelenting sun or threatening rain. Annie notices this inconsistency and she reveals that it is very common for the weather to act like this while a Spirit Walk is taking place. She believes without a doubt that these elements of consciousness and nature are connected. With this new bit of information, I inhale deeply in an attempt to take in the spirit of the Peyote walk.